So Mr Humble decided he wanted to eat fewer critters as part of his new years resolution (perfectly fine by me, as he has always been the carnivore of the two of us). So, I'm finding ways to modify some of his favorite dishes. 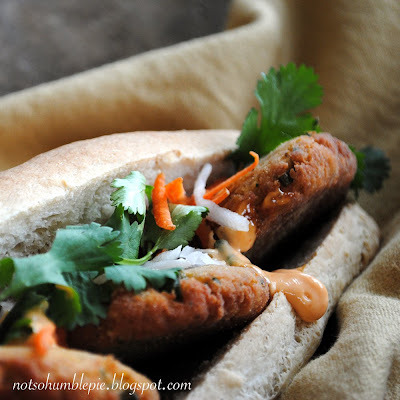 Lunch today is a spin on meatball banh mi, pescetarian style (since the fish sauce prevents it from being vegetarian. Though you could substitute it with a little light soy sauce, if you must do without). Rather than using a meat substitute, which I am generally not a fan off, I went for chick peas, bread crumbs and spices to make my 'meatballs'. Sort of a Vietnamese play on falafel. I baked up fresh rice flour baguettes, stuffed them with my meatballs, cilantro, shredded carrots, daikon radish and my special sauce. Combine the chickpeas, basil, cilantro, garlic, chilies, white portion of the green onion, chili and fish sauce into a food processor and blend for about 30 seconds until well blended but still slightly chunky. Scrape down the sides of the bowl and blend in the eggs. Pour the mixture into a bowl and stir in the remaining chopped green onions. Add the bread crumbs and mix well. Using your hands, form the mixture into one 1 1/2" meatballs and roll in chickpea flour. Bake in a 350 for 15-20 minutes turning once. You can also flatten the balls and pan fry each side in vegetable or peanut oil over medium high heat until golden brown. In a bowl, combine the warm water with the yeast and sugar and allow to sit for 5 minutes. While waiting on that, sift together the flours and salt. Add the yeast to your stand mixer with the paddle attachment and slowly add the flour on medium low speed. Once combined switch out the paddle for your dough hook and kneed on medium speed for 5 minutes until smooth and elastic. Place the dough in a lightly oiled bowl, cover and allow to rise for 2 hours, or until doubled. Punch down the dough and divide into 6 equal portions. Shape each piece into a slender almond shaped baguette and place on baking sheet. Leave enough room between baguettes for the dough to rise. Cover the baguettes lightly and allow to rise for two hours or until doubled in size. Preheat oven to 420 degrees. 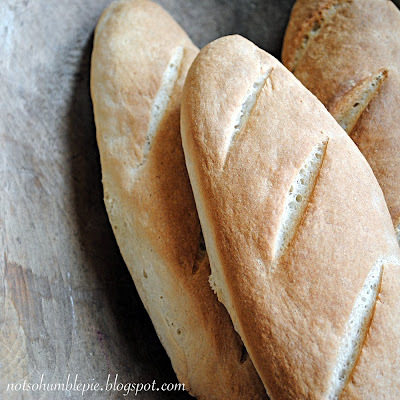 Slash baguettes with a razor or sharp knife and bake for 20-30 minutes until golden brown. 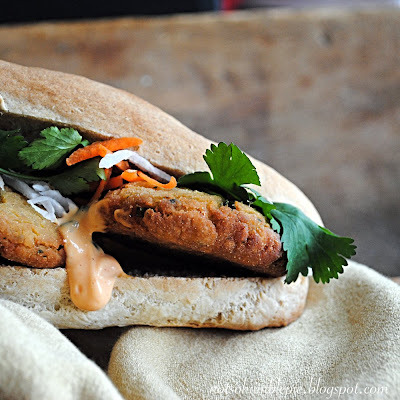 Oh, and if you're wondering why I'm posting Vietnamese sandwiches and not science cookies, patience! Cookies take time. This looks yummy! Any thoughts on how to make a decent TVP burger? We used to buy Boca Burgers, but are thinking about ways to make something similar, that is tastier and low in carbs. I've not played with TVP much, even back in my stricter vegetarian days (though I didn't cook much then). Cooking with meat substitutes like TVP is a little outside of my knowledge base right now, though I certainly may give it a go in the future. I do enjoy the occasional Boca burger, even if they contain enough sodium to pickle me. And all this cookbook talk, folks! I'm flattered really, but I'm the typo creating, run on sentence, ingredient omitting, jelly brained writer queen. Any editor in their right mind would slap me upon reading my manuscript. I can see it happening... I can feel the sting! Beautiful recipe; easy, yet elegant. Filling, health-conscious, and drool-inducing. You rock - in so many ways! The pictures alone make my mouth water, and I already ate. That looks SO tasty and I really want someone to make it for me for dinner...not sure if that is going to happen! The pictures are gorgeous and it looks delicious! Who could be humble when creating food like this? Makes me want to go vegetarian! Mr Humble, you are a very lucky man and Mrs Humble you are a very lucky woman. Not everyone has a wife that loves to cook and make her husband happy and not everyone has a husband to enjoy her passion. With regards to Writing a book, Why don't you submit your blog to a publisher and get some proffesional advise before deciding what the editor is going to do to you. You never know. I know for a fact that I would buy a coppy or two and send them out as gifts. God bless you both in 2010. I just tried this recipe and it's absolutely delicious! Is it bad that at first glance I thought it was a chocolate chip cookie sandwich with lettuce? Can you tell where my thoughts are? Cookies! I have to try this! I love chick peas and I'm always trying to find new healthier options to food. Thanks so much for this! Your recipes are awesome, I will definetely be trying them out! mmmmm this looks so amazing. i like finding veggie foods. It's so fun to see what you can come up with, with simple ingredients such as vegetables. Just so you know, the Asian markets are full of vegetarian fish sauces, and oyster sauces, and the like. What these sauces are is bottled umami, which is simply put the flavor of protien. These sauces are made using mushrooms and seaweeds and can fill in where ever you need extra something to make a meatless dish feel meaty. I get most of my produce and Asian ingredients at a local Korean supermarket and I've never seen vegetarian fish sauce. Of course, it would be easy to miss given the hundred varieties they offer. I'll have to take a closer look at all those bottles next time I'm shopping. great job making your bread and meatless filling! I think I can make these vegan by subbing vegetarian oyster sauce for fish sauce, silken tofu for eggs and for the sauce; i'd just use Vegenaise. I'm definitely saving this! I made this the other night. My kids not only ate it, but ate it all. I didn't tell them it was meatless. What's the point? The garbanzo meatball concept is ingenious. I did my own French spin on them, mixing in spicy Dijon mustard and fresh thyme, and replacing the Thai spices with more European ones. They are delicious, with just a hint of spice.